So what’s so special about yet another disposable e-cigarette you may ask? Realism. The V4L Wow Vapor King is probably the closest thing I’ve seen an e-cigarette got to an actual cigarette. The King line up comes in two strength levels, regular (26mg/ml) and strong (36mg/ml). 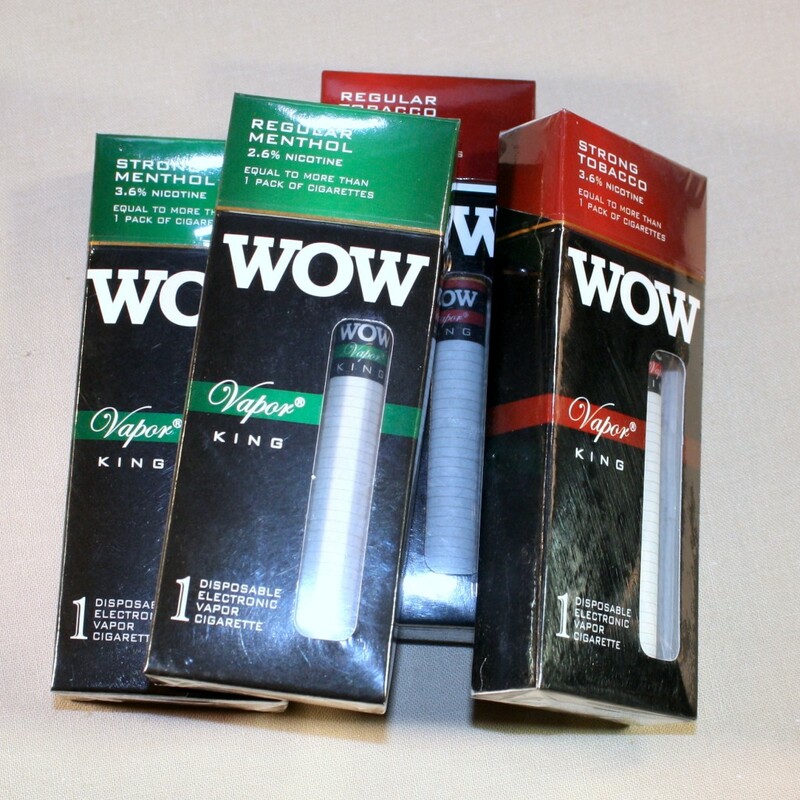 The Kings are available in regular tobacco or menthol. Oddly enough, it almost makes me unqualified to review the product because I haven’t smoked an actual cigarette in quite a long time. Let’s start with the design stuff first. 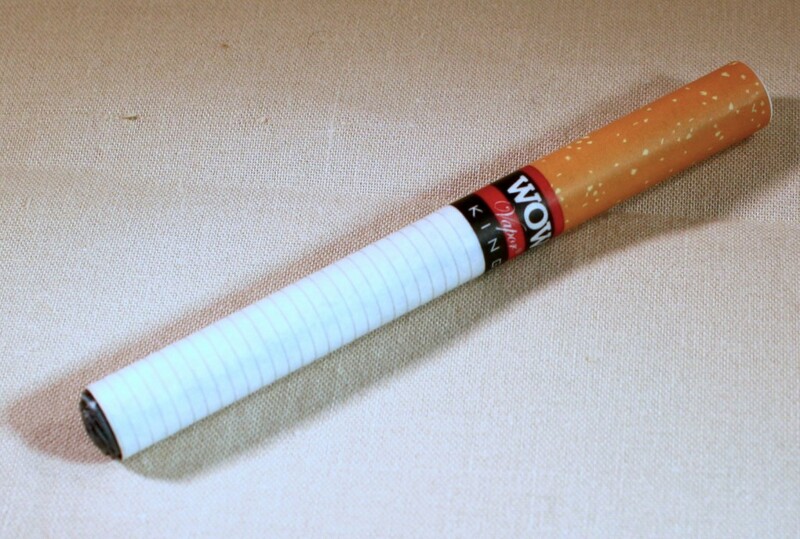 The Wow disposable feels like a cigarette when you touch it. The body feels like paper. It’s still heavier than a cigarette because it has a battery and all that good stuff. It turns out there’s a good reason for that. They used a clever trick to pull it off, it actually is covered in paper. 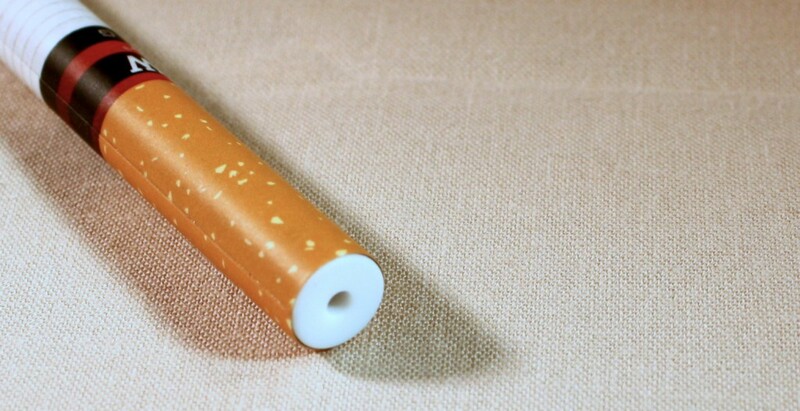 Where many e-cigarettes use a vinyl covering, the King’s is made of paper. I actually only figured this out because I accidentally got the disposable wet and noticed the water absorb into the outer paper covering. Well played, V4l! The “filter” side of the disposable is the same squishy sort of soft plastic underneath that other disposables use to get that cigarette-type tactile experience. Unlike another brand I tested, the King’s battery section is not squishy. Also un-cigarette-like is the tip which glows green. It sort of kills the realism, but gives it bonus points in my book. Creative design aside, the important part of any product is how it tastes. For this part I ended up recruiting a smoker to tell me how it stacks up. I handed a smoker I know very well the lower nicotine version of the King to get her read on the product. It fared amazingly well. My volunteer is very brand loyal and rarely smokes anything other than her usual. Normally the fake tobacco taste of most products does not even come close to passing muster. She noted that it actually did taste like smoking a cigarette, even if it wasn’t her usual smoke. Apparently, it lands on the taste scale somewhere between a Marlboro Red and a Camel Filter. Fairly impressive I’d say since most disposables land somewhere on the flavor scale between the taste of sadness and an unlit pack of cigarettes. I also tried the disposable Vapor King and thought it was too much like a cigarette for my taste. There was a definite smoky flavor to it, which has long been an elusive sensation to get in an e-cigarette. It’s certainly not my cup of tea, but this product very well might be exactly what hold out current smokers need to begin the journey to e-cigarettes. Hopefully these disposables will end up in wide release at convenience stores to go head-to-head with the likes of the NJoy Kings. For now, they’re available at V4L’s website.